The debut Historical Fiction novel The Visionist by Rachel Urquhart details a thrilling story of the Shakers in 1840’s New England. Click here to learn more! It's a strange thing when, far beyond any outcome you imagined while writing it, your first novel gets published. There is the havoc it wreaks on a life that was once reclusive--lonely, even; the welcome but somewhat uncomfortable sense of oneself as--for however brief a time--a public person; the distraction such attention creates when it comes to getting any new work done. But there is something else, and it is, perhaps, particular to writers who first publish late in life. There is the past and the crisp shadow it casts when the light shines brightest. 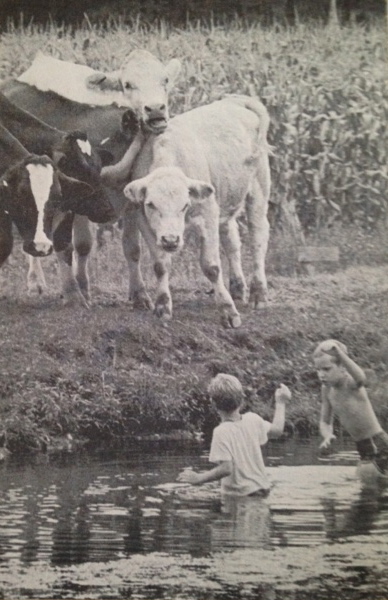 My uncle, Walter Howard, is the reason I wrote about the harsh life of the New England farmer. He could have done anything. Until his hands grew too swollen and chapped from exposure and hard work, he played the piano so effortlessly and well that some people thought he might make a go of it. He wrote beautifully. Quick-witted and generous, he could talk to anyone as though he'd known them for years; there was nothing he wouldn't do for someone down on their luck. He had a bright career ahead of him at Time-Life in New York, but his passion was dairy farming, so he left and chose to run full-time the Massachusetts farm my grandfather had started back in the 1930s. Over decades, he did so with very little help until he died, in 1987. He was only 51, just a year older than I am now. Up at 4 AM to milk the cows, back at 4 PM to do it all over again. Muck out the barn and spread manure on the fields--then do it all over again. Plough the fields, plant the fields, turn the fields, hay the fields--then do it all over again. Feed the cows, feed the pigs, feed the horses, feed the dogs, feed the barn cats--then do it all over again. Read up on bulls who have sired great milkers, buy their sperm at huge cost, then store it inside tanks full of liquid nitrogen until you've found a perfect match. Inseminate the chosen cow with something like a turkey baster designed by NASA, pray for a female calf, pray that her milk yield will have been worth the trouble--then do it all over again. Wake up early on dark winter mornings and unfreeze the water in the drinking tubs with a giant electric coil; do this every dark winter morning. Greet the truck that comes daily to siphon dry the huge tank in the milking parlor. Carry home a calf born in some faraway field; reach a full arm's length into the womb of a pregnant cow to birth a turned calf; burn the calf's horns to prevent them from growing curvy and sharp. Separate the calf from its mother and listen for days to her desperate cries--then do it all over again. Tap the maple trees, empty the buckets, empty the buckets, empty the buckets, then boil the sap inside a huge metal trough over a fire in the field until it turns to syrup. Fix the tractor, the brush-cutter, the baler--then do it all over again. Mend the fences, mend the fences, mend the fences--then do it all over again. In a book titled, Sisyphus in the Hayfield: Views of a Berkshire Farmer, he wrote with great humor and elegance about farming. His essays show what it really means to love the land, even if that same love is what ends up killing you, as it did him. "Chop it up, bale it, cube it, I don't care what you do--you cannot containerize an acre. Those evil little sounds you hear are the grass starting to grow again under your tired old feet, and the brush creeping in around the edges when your back is turned. This year's shoot is next year's sapling, and for every field cleaned off, there's another abandoned forever to the trees around it…"
There are lots of people I wish were still here: my grandfather, Sidney Howard; my godfather, Ralph Bunche; my first father-in-law, Mike Kalogerakis; my second father-in-law, Philip Herrera; the woman I think of as my godmother, grandmother and idol all rolled into one, Anna Hamburger. And more. So many more. But it's Walter I most wish I could have shown my book to. He'd have set me straight where I went crooked; helped me hack through the brush; told me to stop whining and just get it done. Then, in his quiet way, he'd have cheered as I headed for the final tree line.